This story is the first of many that I will be publishing here that have to do with the old west and gold mining around the 49er era. They are all unique in the fact that, even though they are printed here in their original form, no credit can be given to the original authors due to the source where they were found. I was living in an active gold camp along the Stanislaus River outside of Columbia California in 2013 when I found these stories in a book in a store. When I ask the price of the book I was told since it was a 2nd printing from 1897 it wasn’t for sale but I was invited to read it and copy some of the contents. I spent a lot of time at the store every week when I made my usual trip to town for supplies. Since most of the stories are fairly short I was able to copy almost the entire book and I believe it is time to share them in a different format for everyone to enjoy. Now on to the first story on the list. In a manner very reminiscent of the old western movie “Paint Your Wagon” – this great find was made when digging a grave. This is an exciting story connected with the finding of the Oliver Martin nugget, one of the largest ever found in California, which sold for $22,700, after it had earned $10,000 from exhibition in various parts of the country (the value would make the weight very nearly 1100 ounces of gold). Although a young man, Oliver Martin was little better than a tramp. He spent his time in doing odd jobs and drinking whiskey around the mining camps of Yuba, Tuolumne, El Dorado and Calaveras counties. 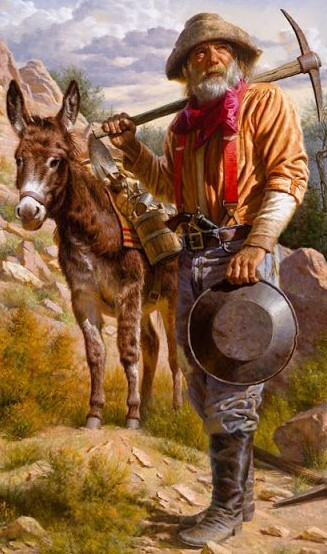 He didn’t even own a pan, much less a rocker or long torn. One of his close companions was John Fowler, who was equally shiftless and dissipated. One night in November, 1854, the two were on their way from Benton’s bar over the Grizzly Mountains to Camp Corona, the spot made famous in literature by Bret Harte. The fall rains had begun, and the streams were running high. On the night of the 7th, almost stupid with drink, the two sought refuge in a deserted miner’s hut. During the night a heavy rain, peculiar to the mountain ranges, set in. The water fell in torrents, and came pouring down the precipitous mountain sides. The narrow canyon where Martin and Fowler lay asleep and drunk was soon filled with the rushing waters, which threatened to sweep away the old shack of a building in which they were resting. They were awakened by the water pouring into the cabin, and sought to escape by climbing the steep sides of the canon. Both men were swept back into the flood and were carried down the stream in the darkness. Martin was washed into a clump of live oaks, and managed to lodge, clinging to the branches until morning, but his friend Fowler was not so lucky and had drowned. The next day, November 8th, toward noon, when the waters had subsided, Martin secured a pick and shovel, and started to bury his dead companion. He selected a sandy spot at the base of the cliff, and had not dug down two feet when he came upon the nugget. He made several tests before he could convince himself that it was really gold. The chunk was bigger than a bull’s head, and far too heavy for Martin to carry by himself. He hurried to Camp Corona to secure help. He had some difficulty in persuading anyone to go with him. At last one of the miners consented, but carefully made the statement that he was going to help bury Fowler, and not to carry nuggets, as he, like others in the camp, placed no confidence in Martin’s story. The chunk weighed eighty pounds and required the combined efforts of Oliver and his assistant to get it to the camp. Before starting back to camp, both men staked claims, Martin, of course, claiming the spot where he had unearthed the big nugget. As soon as the news of the great find spread, miners flocked in by hundreds, but although the stream was carefully prospected for miles, nothing of any great value was found. Martin considered that his find and the peculiar circumstances attending it was an act of Providence, and he never touched intoxicants thereafter. With the money he got from the sale of his nugget he went to mining in a business-like manner. Later he was attracted to Yucatan, where he made over half a million in quartz mining. He died in New Orleans a few years ago, leaving a fortune of over a million dollars. This poem was written by my father in 1977 which was the year me and him had the adventure of a lifetime for a father and son. My older brother and I were both in the local Boy Scout troop and our father was the Scoutmaster for many years. It was a wonderful arrangement between a father and his sons. It got even better when I decided to follow in my older brothers footsteps and go to the “high adventure camp” known as Philmont that the Boy Scouts had created in northeastern New Mexico. During the last training week I attended in northern Virginia one of the leaders had to drop out of the trip and my father was asked if he would be interested. Of course he said yes and the rest is history. This poem tells a story. It is a story about a man and a small group of teenagers including his son (me) and an epic journey, both for the man, and also the boys who would be tested as men. Some of the content will make little sense to anyone who has never experienced Philmont but I think you will enjoy it all the same. From Virginia to New Mexico. Which seemed the long way to go. Had a day at Six Flags. We soon made fast tracks. If you stay on their “good side”. How great it felt. FALLING!!! To be clowning around. FALLING AGAIN!!! And take his picture too. But he enjoyed the other crew’s. The climb she wasn’t easy. By an hour or two. And the trail signs too. That gave us the screws ! It’ll be a while yet. Of that I’m very sure. An experience so rich and pure. This poem is dedicated to a GREAT crew. In the mid sixties during the early years of the Vietnam War my grandmothers youngest son, my Uncle Curtis, was stationed in Germany with the US Army. While there he visited the Black Forest area and during his visit he decided to buy three clocks for my grandmother. One was a cuckoo clock and the other two were known as “Parlor” clocks. One of them was a large rectangle box shaped beauty with a large face attached to hand made clock works inside a dark wooden cabinet with old fashioned glass all the way around in the shape of cut out windows. It made a magical sound when it chimed on the half and full hour. The third clock (in the picture) was the fanciest and biggest clock of the three. It hung in the front room of the house I grew up in and was always one of the first things noticed by first time visitors. When it chimed you could hear it no matter where in the house you were. It was a deep sounding ring followed by a higher pitched ring that vibrated in your head if you happened to be in the same room. One of my favorite stories about this clock happened one year during the Christmas season. If memory serves me right I had just turned twelve a month before one particular Christmas eve when my older brother, younger sister, and I cooked up a plan to beat our parents long standing rule about Christmas morning. To understand the rule I must first give you a mental picture of a typical December at our house in the early seventies. My parents always made sure Christmas was pretty special when we were growing up. There was always a pile of presents for each of us, most of which we had asked for but every year there was always at least one surprise gift for each of us and my mother went to extremes to keep secret. They would start the yearly gift buying just after Thanksgiving and it became a game for us about where presents were hidden and who’s name was on them. Most of their secrets stayed that way but it was always fun to search. Another really cool thing about my time growing up was moving in with my grandparents, which happened soon after my Uncle Curtis was killed in Vietnam. He was given orders to go there from Germany where he had just sent my grandmother’s clocks from. What made this really bad time in our lives a little better was the fact we came together as a family, and as a result my brother, sister, and I ended up with two sets of parents. It also meant that Mom would come up with “The Rule” about the same time. The rule was simple. We could get up and come downstairs to the front room but no one was allowed to enter the living room until our grandparents had joined us in the front room. This was a big deal for my mother because of the time she spent transforming the living room into a magical place for Christmas morning and she always wanted everyone in the family to experience it together on that special morning. That was also about the time my siblings and I realized that if we got up a little bit early we could make “Christmas morning” happen sooner. Like two hours early the first time we tried it. The three of us decided to wake up and meet in the hall at 4 am. My younger sister was sent in to wake up the grandparents who had their room on the second floor with us. Once the grandparents were on their way down the stairs we would be in the front room and the noise would wake our parents on cue. The plan worked great the first time we tried it, but the second time was when I was 12. Due to the previous years plan, which was figured out pretty quick, the new rule from our mother was “time based”, meaning we had to wait until 6 am to be in the front room with grandparents in tow. No biggie … We just revised our plan to include setting every single clock in the house back by three hours, meaning Christmas morning that year was to take place at 3 am. After meeting in the hall at the set time, which was 2:30 am, my brother and I proceeded to change all the clocks. Since he was the oldest and also the tallest he got the job of changing all three German clocks while I was sent on my part of the mission which was to crawl into our parents’ bedroom and change their alarm clock to match the rest in the house. Once everything was set we sent my sister upstairs to wake up the grandparents and you know the rest of the story. Well almost the rest. We all had a fantastic Christmas morning right up to the point where my grandfather suggested making everyone breakfast, and my mother looked outside to see pitch blackness. You would think we had it coming but once again since it was Christmas morning, my mother laughed it off with the same promise it wouldn’t happen again.